Ruth Adler will take over the third floor hallway gallery for an exhibition of her textile collage paintings and textile installations. Ruth lives in Toronto and Tel Aviv and some of the artwork in this show was also created in Hawaii. Wherever she is, she collects fabric remnants from textile markets and discount dry goods stores that she combines with paint to create her colourful semi-abstract artworks. Printed textiles reference different times, cultures and histories, they infuse her work with notions of fashion, industry and craft. 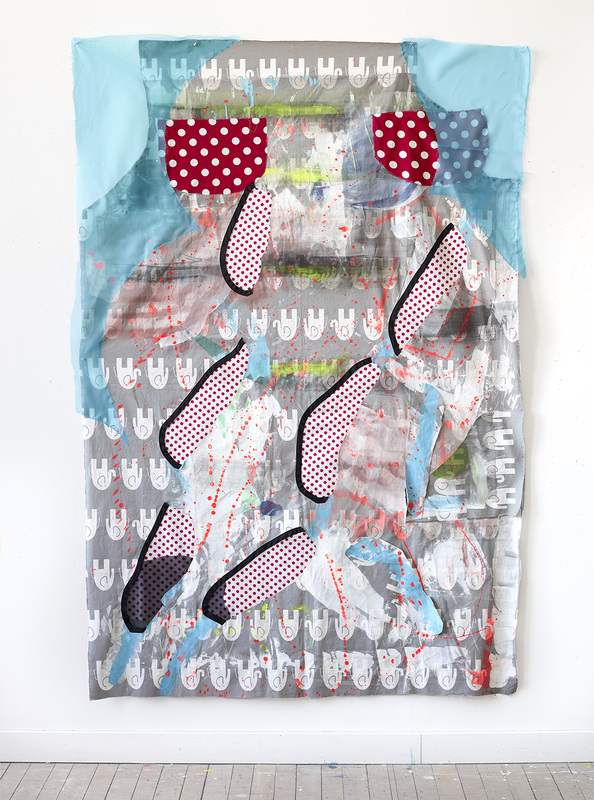 In her experimental approach to bringing textiles into her painting practice, she deconstructs and re-imagines them and offers them back vibrantly reconfigured. Ruth’s work has been exhibited internationally since the 1980s. She has presented numerous solo exhibitions including, Jim Kemper Fine Art (New York), Lonsdale Gallery (Toronto) and Lorber Gallery (Tel Aviv). In the 80s and throughout the 90s she ran her own t-shirt label in Tel Aviv and designed t-shirts for Marci Lipman in Toronto. Ruth has received awards and grants for her work including a Bravo Fact award for her video work. She has also received commissions from the Iroquois Hotel (New York) and The Schneider Children’s Medical Centre (Petach Tiqvah, Israel).